At the beginning of the Memorial Day Weekend holiday in the U.S. 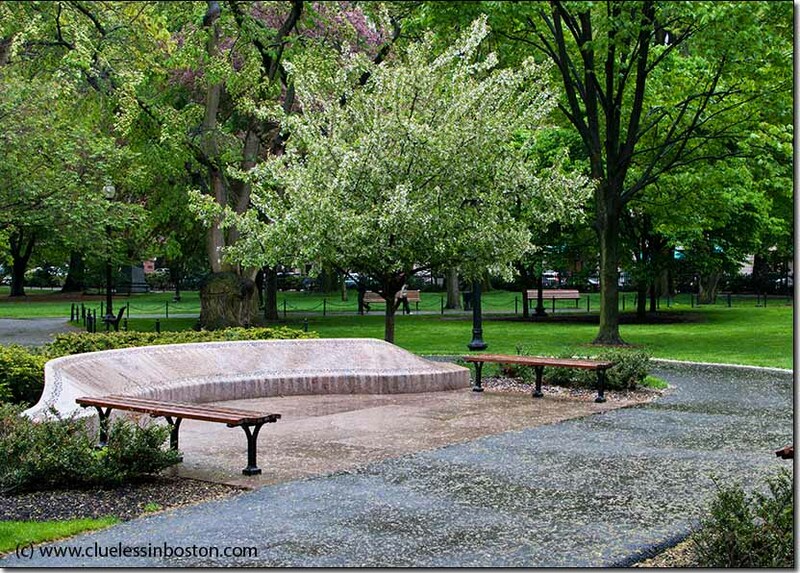 I thought I would show the Garden of Remembrance in the Public Garden. Completed in 2004 and located near Arlington Street, this memorial commemorates over 200 individuals with ties to Massachusetts who perished in the 9/11 terrorist attacks. Designer and landscape architect Victor Walker surrounded the memorial with benches, plants, and flowers to evoke a sense of tranquility in a public setting. A selection from a poem by local writer Lawrence Homer encourages us to find peace in this spot. “Time touches all more gently here,” he writes. A display of flags for fallen Massachusetts service men and women was set up yesterday on the Common. You can see some pictures I posted on my sister site, Light Impressions. Beautiful garden. I will make sure to visit next time I am in Boston. Love your pictures of the flags. Very, very nice. Thank you. So strikingly simply beautiful. Wishing you a good Memorial Day weekend. It is important for a people to remember those whose sacrifices keep our liberty. This looks like a lovely place to sit quietly and reflect. Simple ,and peaceful. A beautyful tribute. That is very special. I'd never thought about local communities honoring their victims of 9/11...probably 'cause there aren't that many down here or further away from NYC. beautiful shot of a tender place. Have not seen this- would love too. The colors of the walk and the trees are so soothing and calm. Thank you!